What we really need for downloading music from the Internet is a convenient application. Qtrax¸ known worldwide, has been designed to facilitate downloading songs from the Internet and share them online. Search option: it is easy to find songs with Qtrax. This software features a powerful and quick search engine. Users just need to enter the name of the song to get all the necessary information. Download: this software can be used for free and authorize legal download. Millions of tracks are available for download. A simple mouse click is enough to start the download of a chosen song. Playlist: Qtrax generates a large number of downloaded files containing custom audio playlists. 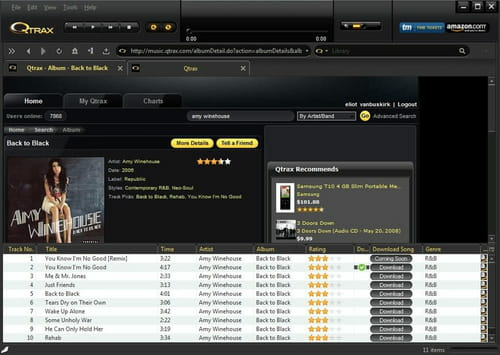 The user is free to choose the tracks to add to its list and listen to them directly through an integrated music player. Information: in addition to these features, it is possible to obtain more information about each downloaded song. For example, you can have a biography of the artist, lyrics, links to videos and much more. Its intuitive interface is ergonomic. Latest update on November 21, 2016 at 05:43 PM.